Awde St. This street was opened by the City of Toronto in 1908 and named for the Awde family, owners of this estate. Robert Awde (1838-1921) came to Canada with his family in 1868 and was for many years employed as a health inspector and later chief health inspector for the City of Toronto. He retired in 1918 after thirty-eight years of distinguished public service. 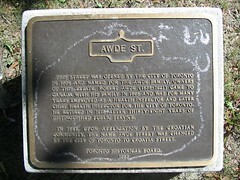 In 1981, upon application by the Croatian community, the name Awde Street was changed by the City of Toronto to Croatia Street.